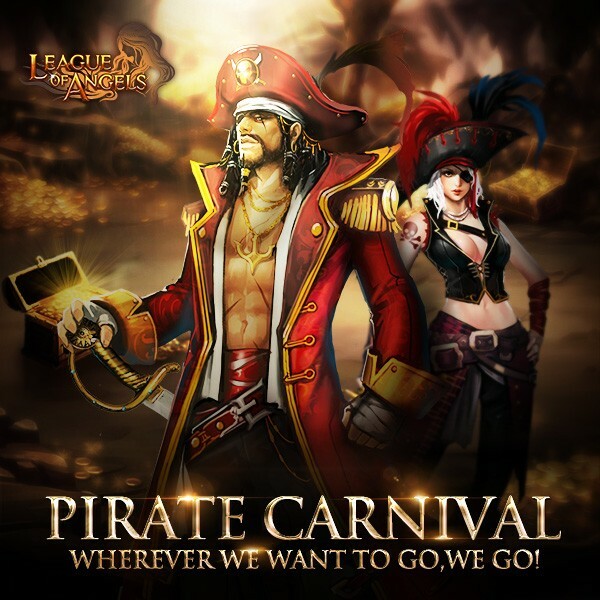 LoA_Enjoy Pirate Carnival​, Get your Treasure! The legendary lost land has been found in east sea. it was said that there are countless valuable treasures in there.People all crazy about it and ready to set off on their adventure. Come and enjoy this carnival! Fnd your own treasure! 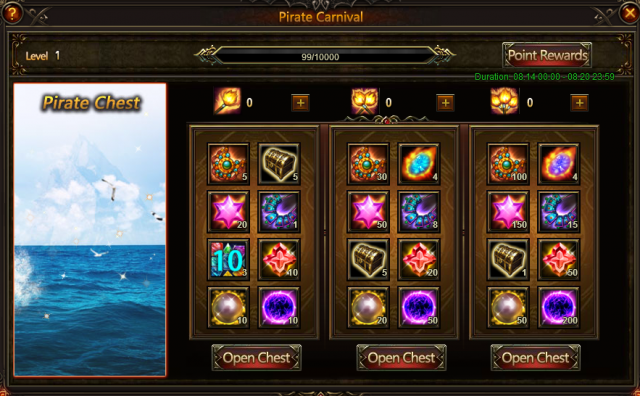 Click the icon of Pirate Carnival you will see four parts. 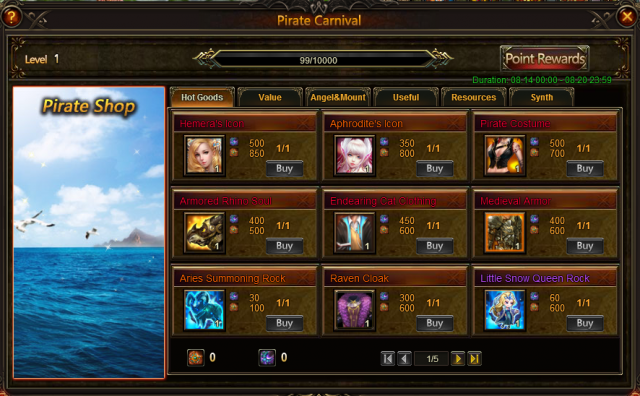 They are Pirate Spirit, World Boss, Pirate Chest, and Pirate Shop. Fight together and get great rewards here! Click Pirate Spirit you will see this panel. 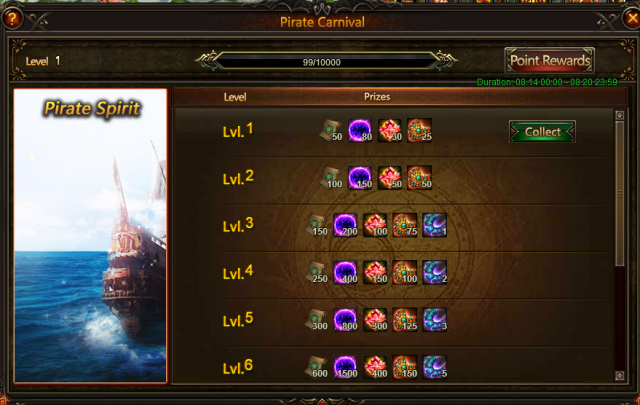 When Pirate Spirit EXP reach certain amount, all players in this server can collect the rewards. 1. 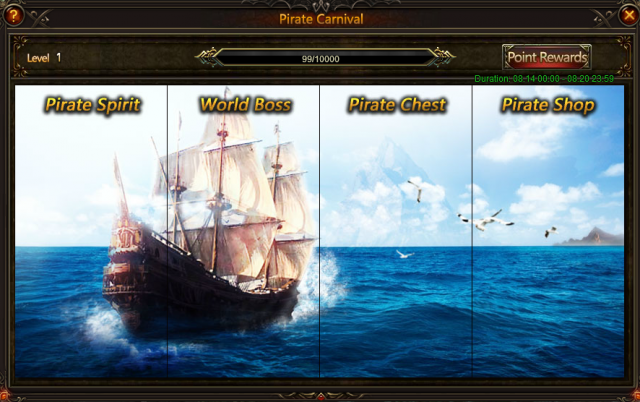 Pirate Carnival consists of 4 parts: Pirate Spirit, World Boss, Pirate Chest, and Pirate Shop. 2. Every Ruby Necklace acquired will earn a player 1 personal point and increase the Pirate Spirit's EXP by 1. Every Sapphire Necklace acquired will earn a player 2 personal points and increase the Pirate Spirit's EXP by 2. 3. All Pirate Spirit level rewards can be collected once daily when available. 4. Join the World Boss during the event for a chance to receive Ruby Necklace . The top 50 in World Boss ranking have a chance to receive Ruby Necklace and Sapphire Necklace! Resources, Ruby Necklace , Sapphire Necklace, Seraph's Stone are waiting for you in Gift Boxes! You can randomly get one of the following items with different kind of torchs. There are 3 kinds of gift boxes. You need to collect Torchs to open them. You can get Normal Gift Box Torch, Angelic Gift Box Torch, Divine Gift Box Torch through hot events or use diamonds to buy. You may ask, how to deal with the Nceklaces I have got? Ok, here comes a chance for you to exchange items with Nceklaces! Here you can get mount Armored Rhino, Reindeer, Phoenix, Floe Hunter,Celestial Hunter, Angel Hemera, Aphrodite, Elena, Fairy Blessed Baby, Little Snow Queen, Clothing Pirate Costume, Endearing Cat Clothing, Medieval Armor, wings of Spring, and many more other items! Description: Complete daily challenges to collect Sapphire Necklace! Description: Complete daily challenges to collect Ruby Necklace! Description: Collect enough Pirate Torch to open more chests! Description: Recharge certain amount of diamonds to get items! Description: Log in everyday to collect Normal Pirate Torch and Rose! More exciting events are coming up through Aug 14 to Aug 18 (server time), check them out in the in-game Hot Events menu! LoA_Gorgeous Wings of Spring in Starry Dream! LoA_New Angel Ysera Shows Up in Lucky Tree! LoA_Special Bonus for Djjinni's Merchant! LoA_Resource Tycoon: Compete For Incubus and Polly!